For many years, I’ve been both fascinated and horrified by those towering wind turbines you see perched on remote hills, scattered across swathes of empty countryside or punctuating the seascape. I’ve no quarrel with alternative forms of energy; quite the reverse, in fact. But, for me, these towers are the eerie sentinels on the horizon: brooding, menacing, waiting. Something about their quietude (at least as I perceive it) troubles me, their huge rotor blades slicing through the air, endlessly turning. The fascination is such that – wearing another of my hats – I’ve long desired to record the sound of what they do, to stand beneath one, contact microphones attached to the alien shell just to hear inside: would there be a deafening and deadening silence within? You can imagine my pleasure then in stumbling upon this little volume by film-maker and writer Adam Scovell. 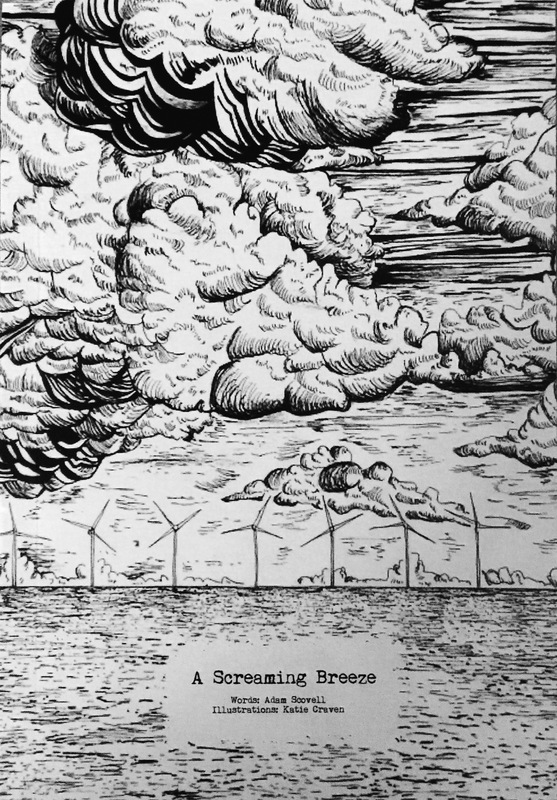 A Screaming Breeze is, for want of a better expression, an offshore ghost story, illustrated very fetchingly and atmospherically by Katie Craven. And it’s rather tiny: 15x10cm in size, with small (8pt), dense type across its 26 miniature pages. The tale’s protagonist, Horace, is a technician for a wind-farm off the Norfolk coast, ferried out to a turbine, left to carry out required checks and maintenance, and then collected again by boat at an appropriate point later in the day. Sounds all rather straightforward. But it’s whilst he’s at one of the structures (and indeed in it and on it) that he experiences a little more than he bargained for. What transpires is unsettling, surreal, dreamlike and – yes – frightening. I enjoyed Scovell’s story very much. Its setting is unusual and defiantly modern, and yet the atmosphere generated by the isolation of the location conveys that pleasingly familiar sense of dread we experience in the best antiquarian ghostly tales, whether set in decaying mansions or on windswept hills at dusk. Perhaps there’s also the symbolism of environmental concern and activism running through this tale: Horace, like it or not, represents the sometimes unwelcome presence of wind-farms in more ancient landscapes, and of course the sea is older than any of us and infinitely more cruel. This handsome little book is available (at a price that made me do a double take, so inexpensive did it seem!) from here. I’m tempted to buy some more copies and give them out to friends. A warning to the curious, though: despite its diminutive size, there’s a reasonable length to this story, essentially because of the small font size used. It may cause eye strain, as well as those welcome shivers!